Competition especially of the political kind is lively fare in the Mile Square and Ft. Lee may have traffic and snow cones near a bridge come and go making some waves but Hobokenites know when its political drama, you can't beat this town especially since the Sopranos departed HBO leaving the real crime entertainment here the only game in town. Quite a bit swirling in the air including the weights of justice. That inevitable day comes closer as the seconds go by but the truth is forcing its way in no matter how many political operatives (and lawyers) desperately try to stop it. But this is not a column about Beth Mason. There's more than a little speculation about the changing of the guard at City Hall. Changing of the guard Horsey? Well yes, even with Mayor Zimmer and reform advocates sweeping the elections last November, Hoboken's political world is a moveable feast. Much of the speculation revolves around two formerly bitter Old Guard elements. One is unspoken competition between the newly pliable political council members Michael Russo and Timmy Occhipinti. Some political talking heads are convinced the third ward councilman is moving toward becoming a more friendly voice (and vote) with the administration as he looks ahead to a do or die death battle with a motivated Frank "Pupie" Raia who may be formulating payback in the 2015 council ward election for Russo's third ward seat. While Reform doesn't frighten Russo with the entrenched never ending PILOTed Church Towers Buildings, Pupie's deep pockets certainly makes him sweat at night. The running joke is Russo can shoot someone in the lobby of Church Towers residents present and still be re-elected. At the last City Council meeting, Russo was the most vocal (and coherent) opponent on several key votes. Unlike in years past, he didn't try to drag out the proceedings for hours especially on issues he couldn't muster sufficient opposition. A temporary budget, based on a set state formula has been particularly thorny in years past but this round some minor protests of no substance revolving around $40,000 being earmarked to the Hoboken Ambulance Corp. died a quiet death. The idea the funds given annually should not be paid in full with room available in one payment versus two in the course of the year was the political posture but did anyone believe for a second the proposal paying in more than one installment saves the taxpayers any money in the same fiscal year? So Michael Russo is looking less enamored with the losing game of huffing and puffing or yelling about the KKK as he looks at reform council members these days with the greenbacks clearly out of anyone's Vision 20/20 reach. Does it mean he's trying to play kissy face with the mayor? Timmy Occhipinti has learned how to count. He use to count the ways money could find its way into his campaign coffers, be it developers or one despairing, improperly medicated councilwoman with oodles of cash from her husband's bankruptcy practice billing hefty numbers. Hoboken unlike most places however has something opposing the money bags at election time more powerful than greenbacks - the grass roots. Timmy was shocked, shocked to learn Hoboken City Hall's mayoral seat isn't for sale to the highest bidder. He could have looked to 2009 as an example where seven figures are spent and the public magically refuses to hand it over to his chief sponsor but apparently he didn't believe it. He simply confused it with the fourth ward seat where the council seat is most definitely often subject to purchase. This he learned all too well with hundreds upon hundreds of bought votes handing him the seat stamped "occupant for the Hoboken Syndicate." The official ELEC reports showed last November all three campaigns spending about the same. In Hoboken, what an ELEC report says doesn't always add up to what actually took place. Coming down the stretch Assemblyman Ruben Ramos was in dire need of cash (and found it) got some reportedly from outside friendly sources including MSTA, the developer group suing to get fraudulent votes tossed added back into the November election results in order to overturn the rent control ballot question. Mayor Zimmer showed a competitive cash balance but in the end didn't expend more than necessary to get out her message running on her record of accomplishment. The Raia-Mason campaign had a different methodology splitting the underwriters cash terms. While the talk of moles, freeloaders and a campaign running amuck is the continuous chatter of Mile Square politicos to this day, the big untold story is how much money was coming in and spent outside of ELEC reporting. When it comes to frivolous election spending (and lawsuits) it's the Mason crew leading the Newton Lao Leonard & Locke way. That way, by hook and by crook is a years long enterprise paying multiple Beth Mason political operatives, according to a high placed source in yet to be released SLAPP suit testimony. What Timmy Occhipinti learned, on a gravelly pitted road is money doesn't buy Hoboken like it used to and if he is to survive on the float off shore, he's going to have to find a shifting tide fast before Ruben Ramos comes looking for his head in ward elections next year. The posture of the fourth ward council seat occupant has dramatically changed over the last five City Council meetings. No longer petulant, boisterous, interjecting over others constantly, the demeanor has matured from a fifth grader to an adult. More interesting, he voted more times than not at the last council meeting with the reform council majority on all the major issues. While one local political columnist said it's Michael Russo moving reform's way, it's actually Occhipinti who has been the most effective heading in that direction. The intent if observed closely shows the thought is clearly meant to prove it in both demeanor and voting. earwitness dish and corruption busting exclusives in the land. Talking Ed Note: Today Da Horsey salutes Grafix Avenger who produces the most laughs at the expense of corrupt politicos, (her hired henchman) and political operatives - way beyond her fighting weight in all of northern New Jersey or is it the entire state. 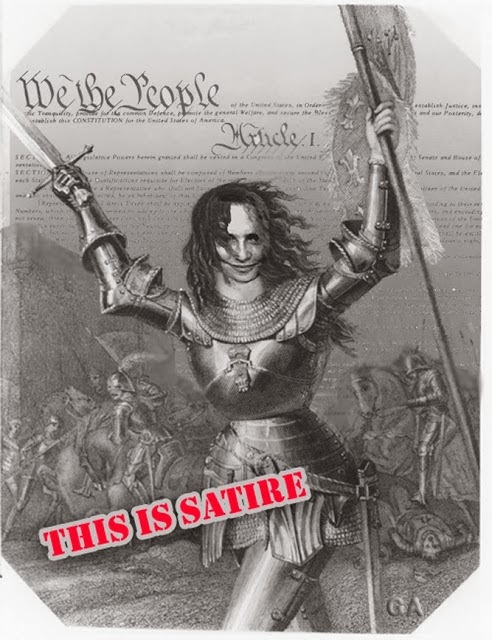 She is underestimated in her skills, and has conquered multiple fronts in architecture, satire, news breaking corruption stories and continues to hold high her sword and reform banner in the face of the most vile extortion conspiracy directed by a bitter harridan and her army of political operatives. Agreeing with her on everything at Grafix Avenger isn't required, but respecting the First Amendment should be. For some, that lesson has to come at the point of a different sword of justice, unavailable at any price.